When to use: If market is near A and you expect market is stagnating. Because you are short options, you reap profits as they decay — as long as market remains near A. Profit characteristics: Profit maximized if market, at expiration, is at A. In call-put scenario (most common), maximum profit is equal to the credit from establishing position; break-even is A +/– total credit. Loss characteristics: Loss potential open-ended in either direction. Position, therefore, must be closely monitored and readjusted to delta neutral if market begins to drift away from A. 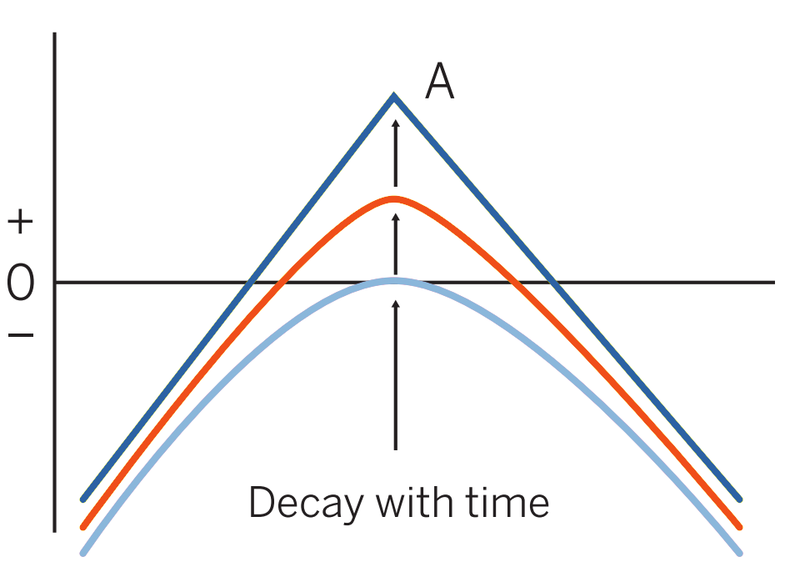 Decay characteristics: Because you are only short options, you pick up time-value decay at an increasing rate as expiration approaches. Time decay is maximized if market is near A. This trader finds a market with relatively high implied volatility. The current feeling is the market will stabilize after having had a long run to its present level. To take advantage of time decay and dropping volatility this trader sells both a call and a put at the same strike price. Breakeven: Downside: 0.8400 (0.8600 strike – 0.0200 credit). Upside: 0.8800 (0.8600 strike + 0.0200 credit). Loss Risk: Unlimited; losses increase as futures fall below 0.8400 breakeven or rise above 0.8800 breakeven. Potential Gain: Limited to credit received; maximum profit of 0.0200 ($2500) achieved as position is held to expiration and futures close exactly 0.8600 strike. This is primarily a volatility play. A trader enters into this position with no clear idea of market direction but a forecast of less movement (risk) in the underlying futures. Be aware of early exercise. 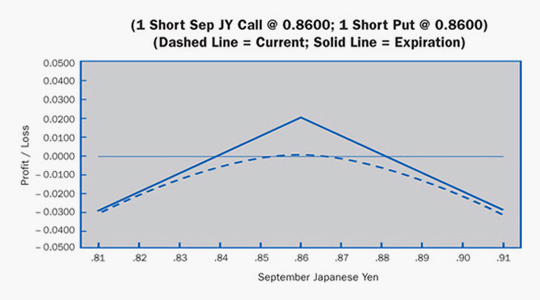 Assignment of a futures position transforms this strategy into a synthetic short call or synthetic short put.